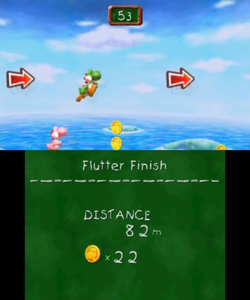 Flutter Finish is a two-player minigame in Yoshi's New Island. It is a remake of Flutter Challenge from Yoshi's Island DS. The objective of the minigame is to flutter jump as far as possible in one minute. A Yoshi starts the minigame in a cloudy area with coins nearby. The player who gets the most points at the end is the winner. The total distance the Yoshi passes is tripled. The number of coins the Yoshi gets is doubled. The two numbers are added together to determine the total score.